Judy Richie is a native of Austin, Texas and has been active in art since an early age. While still in high school she was chosen to attend a summer art camp at the University of Texas with the intent to major in art. A minor detour of marriage, six children and moving to Colorado and later to Alaska to marry her present husband, Bob, temporarily interrupted that goal. After moving near the small town of Lake City, Colorado, Judy painted and ran her own gallery and later owned and operated a bed and breakfast inn for eight years. While in Colorado, Judy attended several oil painting workshops. 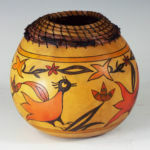 She also developed an abiding interest in the art and crafts of the Native American, especially those of the Southwest. 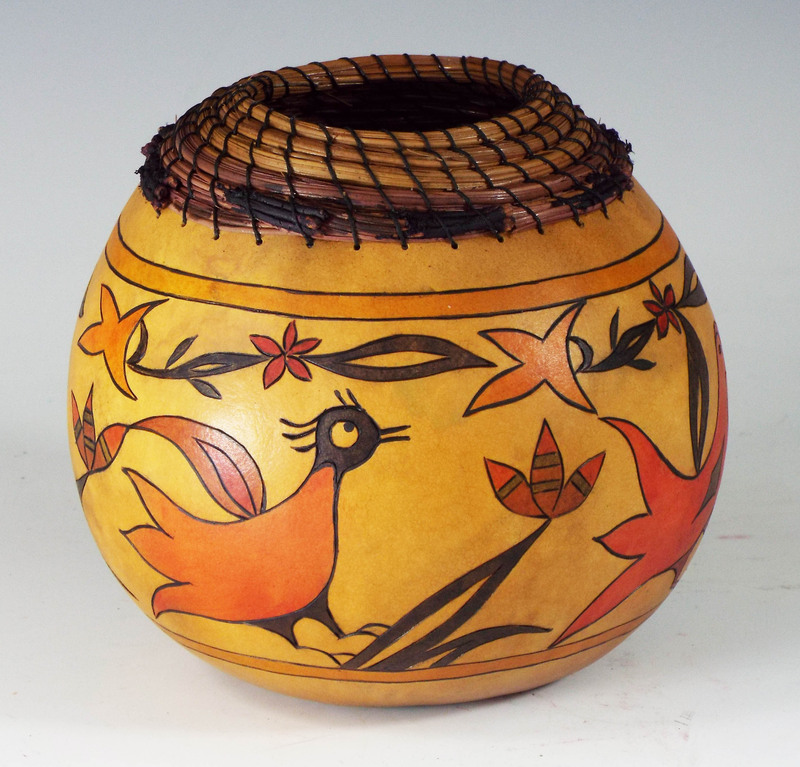 While living in the small town of Valdez, Alaska, Judy became interested in gourd art and with the help of the Internet in obtaining supplies, books and articles from varied sources, taught herself the basics of working with gourds. 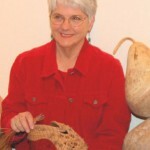 She learned some of her basketry coiling techniques from Aleut and Eskimo women in Alaska. Judy and her husband retired to Kerrville, Texas in the summer of 2002, where she has a studio and pursues her art a minimum of 30 hours a week. 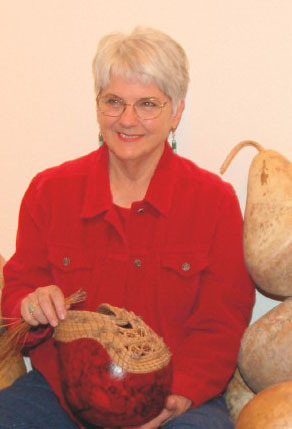 Since moving Kerrville she has expanded her repertoire of presentations and basketry utilizing pine needles, raffia, various grasses, plant fibers, philodendron sheaths, and feathers. Since moving to Kerrville, Judy has won numerous awards for her work including many Best of Show and People’s Choice awards. Today, Judy is renowned for her use of patinas on gourds including copper, bronze, brass and silver metal coatings. Her work is featured in collections in Alaska, Colorado, Texas, Nevada, New Mexico, Missouri, Florida, Illinois, Utah, Hawaii, Arizona, Illinois, New York City and Canada. Judy was our featured artist of the month for November, 2014. You can read the profile here: Judy Richie featured artist profile. Are you interested in purchasing Judy Richie’s work? Please contact Rogoway Turquoise Tortoise Gallery for more information.